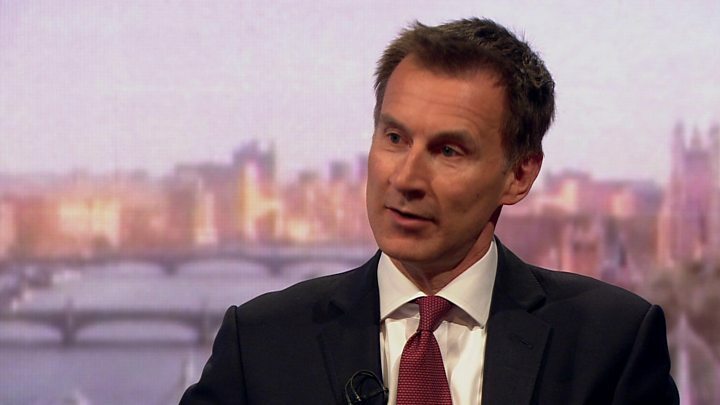 Media captionForeign Secretary Jeremy Hunt tells Andrew Marr the Conservative party is "in very perilous waters"
Conservative MPs should back Theresa May's deal this week or risk losing Brexit altogether, Foreign Secretary Jeremy Hunt has warned. There was "wind in the sails" of those opposing Brexit and the consequences for the party will be "devastating", if it is not delivered, he said. MPs will vote again on the deal on Tuesday, after rejecting it in January. Labour's John McDonnell said it looked like the PM had failed to secure any changes and it would be rejected again. The UK is due to leave on 29 March, although Parliament has yet to agree the terms of withdrawal. MPs will vote for a second time on Tuesday on the withdrawal deal Mrs May has negotiated with the European Union - after rejecting it by a historic margin in January. If they reject it again, they will get a vote on leaving without a deal, and if that fails, on delaying the exit date. Many Conservative Brexiteers voted against the deal in January over concerns about the backstop - a controversial insurance policy designed to prevent physical checks on the border between Northern Ireland and the Republic of Ireland. But there have been few visible signs of progress over the issue in continuing talks between EU and UK officials. Mr Hunt told BBC One's Andrew Marr Show some MPs wanted to "kill" the deal, in order to delay Brexit, with the ultimate aim of getting another referendum on the issue. "Within three weeks, those people could have two of those three things," he said, adding that Labour's position made the third more likely. He said: "We are in very perilous waters, and people who want to make sure that we really do deliver this result need to remember that if it fails... they are going to say: 'There was a party that promised to deliver Brexit, we put them into No 10 and they failed', and the consequences for us as a party, would be devastating." He added: "We have an opportunity now to leave on March 29, or shortly thereafter. And it's very important that we grasp that opportunity because there is wind in the sails of people trying to stop Brexit." If Parliament approves Mrs May's withdrawal agreement next week and the UK leaves the EU on 29 March, it will begin a transition period, when the two sides will attempt to agree a comprehensive trade deal. 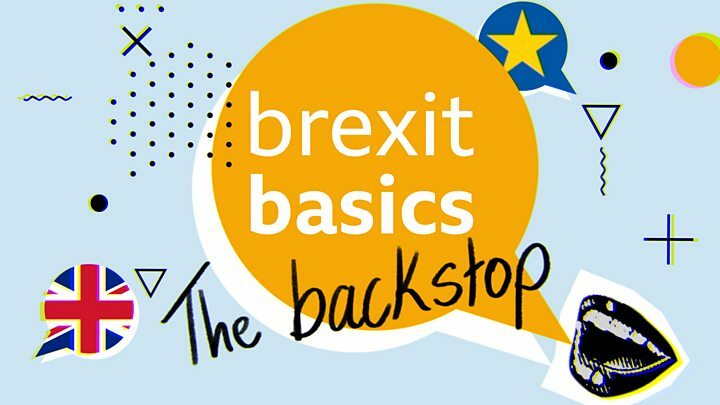 If a trade deal is not agreed by the end of the transition period, the "backstop" plan is designed to maintain an open border on the island of Ireland. 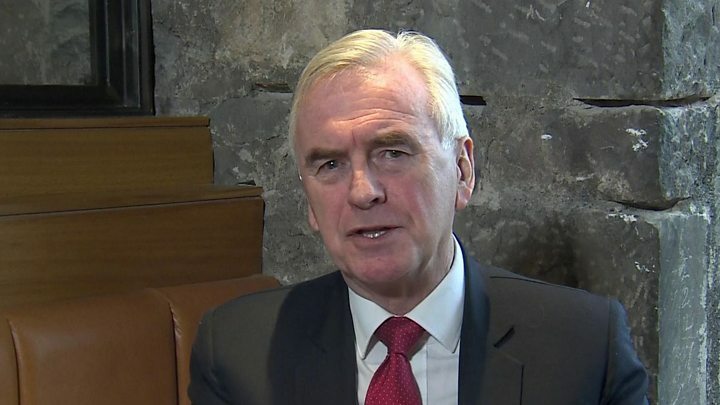 Media captionShadow Chancellor John McDonnell: "This is the mess the PM has got us into"
It would keep the UK in a "single customs territory" with the EU, and leave Northern Ireland in the EU's single market for goods. But some MPs fear that - in its current form - the backstop may leave the UK tied to the EU indefinitely. On Friday, Mrs May urged the EU to help her get the deal through by resolving concerns about the backstop. But Shadow Chancellor John McDonnell told the BBC: "It looks as though she's bringing back the same deal so it looks as though we will have the same result and it will be thrown out." He said the party's priority this week would be to stop Theresa May "driving through some sort of Brexit deal that will damage our economy and undermine jobs" and if that meant a delay to allow for a discussion about the deal Labour backs instead "so be it". He also denied that Labour's support for keeping the option of another referendum open had been put on the backburner, adding: "If Parliament can't agree, if we have to break the logjam, yes, we will keep the option available of going back to the people." And he said he believed that Labour's alternative Brexit deal could be agreed with the EU "within a matter of weeks" but said any delay requested should be "as long as is necessary". Labour's policy is to seek a permanent customs union with the EU after Brexit, which would allow the UK "a say" in future trade deals. Mr McDonnell said the EU had "looked positively" on the proposal. On Friday, the EU said it would give "legal force" to assurances it has already made about the withdrawal deal and its chief negotiator Michel Barnier tweeted that the UK would be free to leave a proposed single customs territory with the EU - provided Northern Ireland remained within it. The leader of the House of Commons, Andrea Leadsom, said she was deeply disappointed by the EU's proposal, which has already been rejected by the UK government. The Brexit Secretary it was "not the time to rerun old arguments".